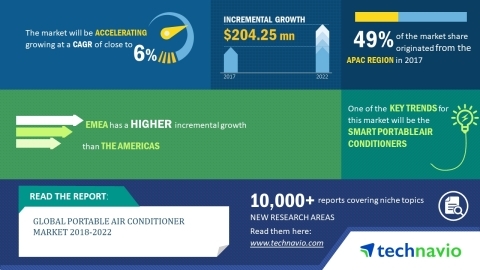 LONDON--(BUSINESS WIRE)--The global portable air conditioner market is expected to post a CAGR of close to 6% during the period 2018-2022, according to the latest market research report by Technavio. A key factor driving the growth of the market is the rising awareness of environmental-friendly and energy-efficient devices. Electronic appliances consume almost 45% to 50% of the total energy expended is a commercial building or house, and the centralized air conditioner consumes almost 4% to 5% of the total energy. To minimize and to control the high energy consumption, governments across the countries are encouraging electronic appliances players to come up with energy-efficient products that consume less energy compared with traditional products in the market. This market research report on the global portable air conditioner market 2018-2022 also provides an analysis of the most important trends expected to impact the market outlook during the forecast period. Technavio classifies an emerging trend as a major factor that has the potential to significantly impact the market and contribute to its growth or decline. Smart and wireless operable electronic appliances are growing popular. Innovative and technologically advanced features such as remote control, wearable control, and weather monitoring are already available in conventional air conditioners. However, the key manufacturers of portable air conditioners are also expected to come up with smart portable air conditioner by integrating the above-mentioned features. “Smart portable air conditioners can be operated through a smartphone to change the temperature and fan speed and to adjust the control modes. These smart portable air conditioners can be operated by installing the concerned applications in the user's smartphone,” says a senior analyst at Technavio for research on home, kitchen, and large appliances. This market research report segments the global portable air conditioner market by end-user (residential and commercial) and geographical regions (APAC, EMEA, and the Americas). The residential segment held the largest market share in 2017, accounting for nearly 85% of the market. This end-user segment is expected to dominate the global market throughout the forecast period. APAC led the market in 2017 with a market share of nearly 49% of the market share, followed by EMEA and the Americas respectively. The dominance of APAC can be attributed to the prevalence of weather conditions favorable to the market and a significant increase in the population over the past two decades. The global portable air conditioner market is expected to post a CAGR of close to 6% until 2022, according to the latest research report by Technavio.